The Naked Lunch. Paris: Olympia Press, 1959. Oliver Harris’s personal copies. Location: Always within arm’s reach. With the exception of Burroughs himself, nobody has thought more deeply and creatively about Naked Lunch than Oliver Harris. This includes Allen Ginsberg, who is closer to the text than anybody besides Burroughs. Unfortunately, Ginsberg did not use that unique access to creatively explore the text. His criticism, like much Burroughs scholarship, is a defense. 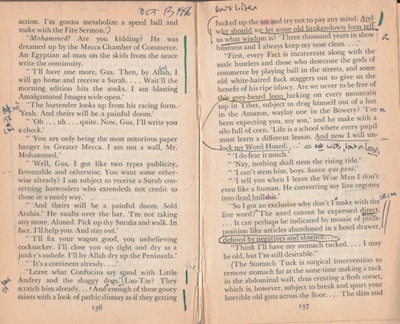 Possibly it is Harris’s personal distance from the creation of the text and the author that allows him to read it so closely and with such imagination. H.J. Jackson in her book on marginalia devotes a chapter to “Books for Fanatics.” As she writes: “[T]he book that has been chosen to protect and preserve the treasures of the owner’s spiritual life.” Harris’s annotated copy of Naked Lunch is holy book, journal, diary, and day book. 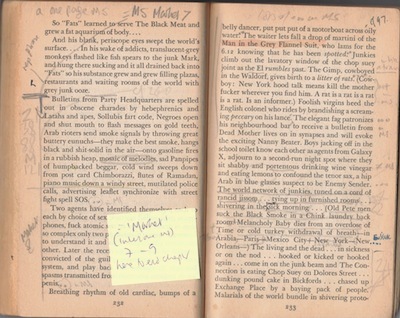 In fact, Harris possesses 12 annotated copies of the Olympia Press Naked Lunch in his personal library. Each new project involving Naked Lunch requires a fresh, clean copy of the book in which to begin. This sparks images of Borges’ Library of Babel, an endless library filled with what on the surface appear to be identical objects. 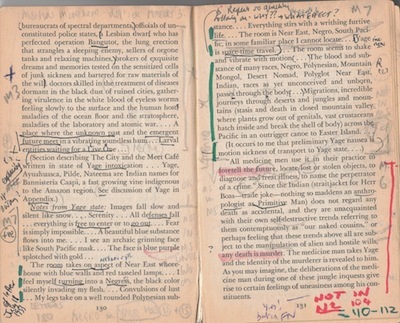 Yet each of Harris’s readings of Naked Lunch is different (even if as Harris admits much of the marginalia repeats from book to book and circles the same obsessive hot topics), just as the Oliver Harris who annotated them constantly changes and evolves. 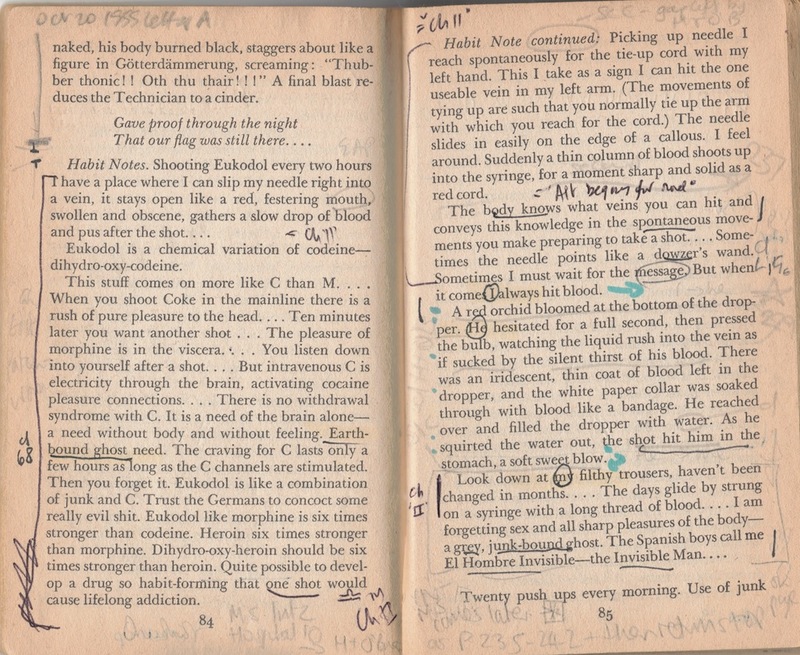 The Oliver Harris who read Naked Lunch in 1993 has disappeared forever, yet he has left his trace, like a fingerprint or Rorschach blot between the pages of Burroughs’ text. The pages of a book are an Interzone, a space between of total freedom and possibility. 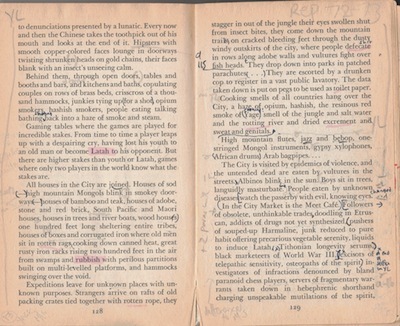 But most of all, Harris’s copies, every page filled with notes and colored inks, are a map: a map of Naked Lunch, a map of Interzone, a map of Burroughs’ and ultimately Harris’s worldview and inner life. On Exactitude in Science. Borges’s Library of Babel and Harris’s study / den have endless levels. Yet one level of Harris’ library contains his topographical maps that chart the layers of Naked Lunch. 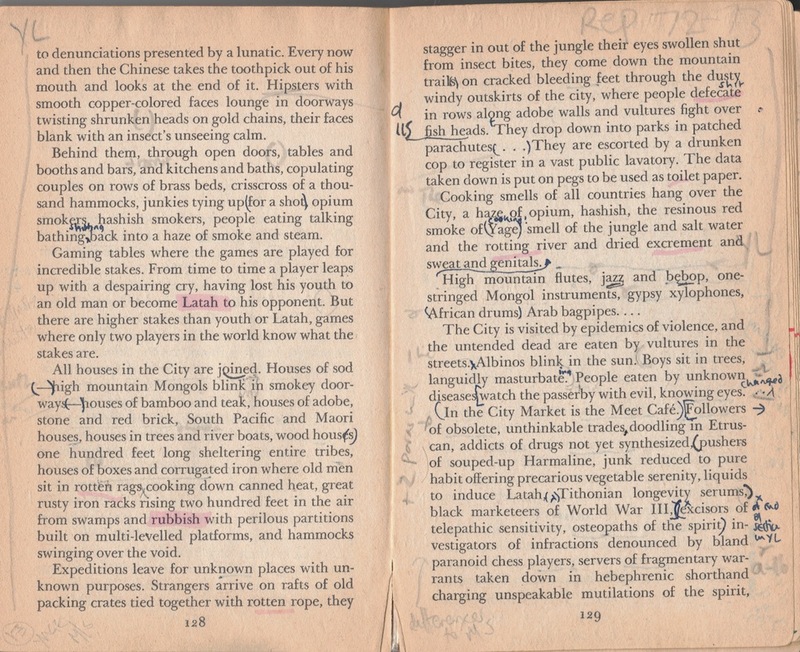 To say nothing of Harris’ unpublished novel featuring a character who maps Burroughs’ Tangier. Harris reveals Naked Lunch‘s unfathomable depths. 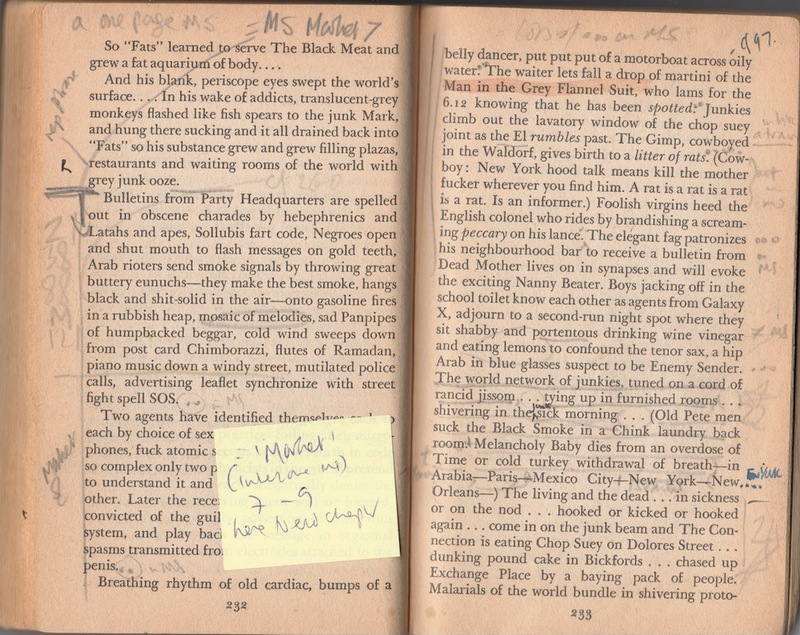 He will never get to the bottom of it; thus his personal copies of Naked Lunch are likewise an endless novel, just as Burroughs intended. The Olympia Press Naked Lunch is also Harris’ briefcase, his accounting ledger, his textbook. He is a scholar and a teacher, and Naked Lunch is what he takes and where he goes to work. The intellectual capital invested in his annotated copies is immeasurable, just as the sum total of one’s life can never be measured or, maybe more accurately, can only be measured by infinitely varied means. 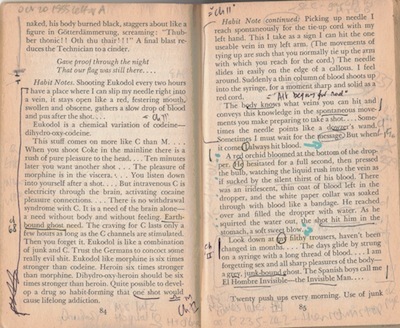 Each of Harris’s copies of Naked Lunch are unique; yet through his scholarship, his map of Naked Lunch and Interzone has become the legend by which we interpret Burroughs’ most inaccessible mysteries, his hearts of darkness. Naked Lunch. London: Corgi, 1974. Oliver Harris’s copy. Soft cover. 12mo. 286 pages. Annotations in pencil.